Mount St. Helens is the most historically active volcano in the Cascade range, having produced four major explosive eruptions since 1479, and dozens more smaller eruptions, including pyroclastic flows, lava flows and domes, and lahars. It is located approximately 80 km NE of Portland, OR. Mount St. Helens is best known for its large explosive eruption, summit collapse and directed blast of May 18, 1980, which was the most expensive and deadly volcanic event in United States history. The volcano continued erupting during 1980-1986, producing a lava dome within the 1980 crater. Mount St. Helens again erupted in 2004-2008, when it produced only minor explosive activity but a series of spectacular lava spines with a cumulative volume of almost 100 million cubic meters that doubled the size of the lava dome. Tremors and millions of small earthquakes accompanied both of the recent eruptions. Since early 2008 no eruptions have taken place and the lava dome has shrunk in height as its steep sides crumble into a broader, more symetrical shape. Here are links to some of the descriptive web pages provided by the Cascade Volcano Obervatory. The Cascades Volcano Observatory and the PNSN cooperatively operate 21 seismometers on or near Mount St. Helens. On average, we locate 4 to 14 earthquakes within 10 km of the volcano each week. Mount St. Helens and the nearby St. Helens Seismic Zone occasionally produce swarms of many small earthquakes, but these are not usually directly associated with magmatic activity. An additional challenge on Mount St. Helens is that small rockfalls commonly occur on the steep crater rim. For lots of detail on the past seismicity at Mount St. Helens see the seismicity page. Seismicity at Mount St. Helens is quite variable depending on the volcano's eruptive state. Most earthquakes are located at a shallow depth directly under the volcano; however there is a St. Helens Seismic Zone (SHZ) that extends north and south of the volcano on which some earthquakes take place. Seismicity changes character just before eruptions begin. There is usually an increase in both number and size of earthquakes as well as a change in the character of the seismograms. Such changes were detected and recognized as precursors to most of the two dozen or so eruptions during the past 30+ years including a two month precursory sequence before the cataclysmic eruption of May 18, 1980. On average (not during eruptions or their precursors) we locate about 17 earthquakes a month at Mount St. Helens. Most of these events are in the depth range of 1-4 km. During eruptions and eruption precursor periods earthquakes are even shallower. There have been a few times during the past thirty years that there have been many earthquakes in the depth range 1-7 km. We interpret these events to be in response to stresses generated by magma recharge into the main crustal magma system. Such recharge seems to have taken place during the periods: 1989-1991, late in 1995 in 1997 and perhaps a few periods since the end of the last eruption such as mid 2014 and 2016. Here is a time-depth plot of earthquakes located directly under Mount St. Helens since 2010. This plot is updated weekly until 2020 when a new plot will start... unless, of course unusual activity takes place that suggests a different time sequence is needed to better interpret that activity. Keep in mind that the PNSN earthquake recording and processing system changed in very major ways starting in 2012 and thus there can be small biases or changes introduced in event detection, location and size. We think these changes are very small but one should still be aware of this possibility. Here is a seismicity plot that shows the number of located earthquakes per day (black spikes) and the cumulative number of earthquakes over time (red). This can point out periods when more earthquakes were located. However, sometimes this is because more effort is taken to locate very small events such as at least partially is the case during the summer of 2014 when the iMUSH experiment was being installed in the region around Mount St. Helens. Here is a map of the last year's epicenters at Mount St. Helens color coded by depth and with symbol size proportional to magnitude. Most events are shallow and lie within the crater. Note: Black circles represent events about sea level (negative depths). Below you will find time-depth and seismicity plots for Mount St. Helens shown by decade, most recent first progressing back in time. These show the typical or background levels of earthquakes under the volcano as well as the intense activity associated with eruptions and magma recharge. We do not include epicenter maps here because at the normal scale produced they don't show anything of interest. 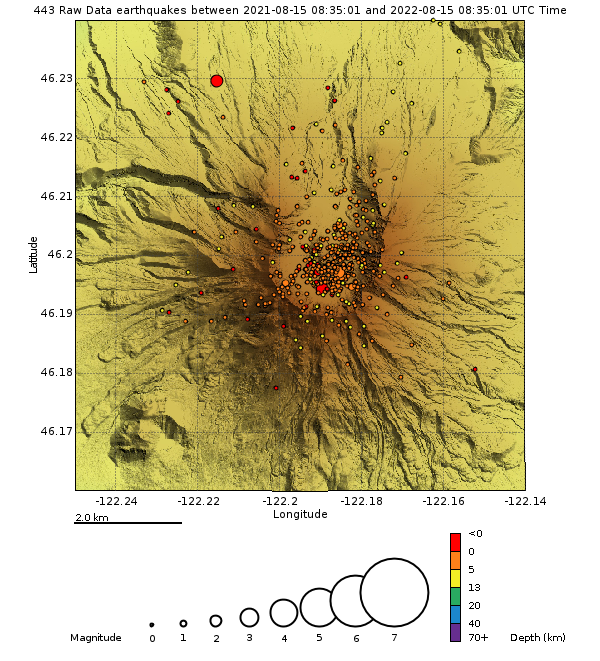 Virtually all earthquakes locate directly under the volcano with concentrations under the crater, similar to the epicenter plot for recent events shown above. Much of the variability in these locations is due to inaccuracies in determining the exact locations. Of much more interest is the depth progression of earthquakes and their distribution in size and depth with time. Since the spring of 1980 there have been a sufficient number of seismograph stations located on (8) or very near (11) the volcano such that the regional seismic network can reliably detect and locate earthquakes of magnitude 0.0 and larger in this area. Even smaller earthquakes can sometimes be detected and located though many also are missed. From Sep. 2004 to Jan. 2008 the volcano was in mild, continuous dome-building eruption (green bar shows eruption time) and produced over a million earthquakes, far more than could be located using traditional methods. A sub-sample of events was analyzed and located and is shown in the following figures. After the eruption quit (Jan. 2008) the seismicity decreased to normal background levels and since then all detected events have been analyzed and are shown in these figures. There were no eruptions of Mount St. Helens during this decade, however, there were periods during which seismicity in the depth range of 0 to 6 km depth is interpreted as due to magma recharge into a crustal magma zone. Such recharge may be relatively continuous with periods of increased flow or pressure or it may be truely episodic. Periods during which we interpret recharge to be taking place are marked with orange bars on the time-depth plot. 5) Again, deep seismicity starting in 1989 and continuing off and on through the 1990s that we interpret as due to pressure increases due to magma recharge. The orange bars on the time-depth plot represent approximate periods where we think magma recharge is taking place. Green arrows (and a bar) on the seismicity plot represents times of eruptive activity, of which only the first few events had a major explosive component.